Mechanics: Card Drafting, Set Collection. 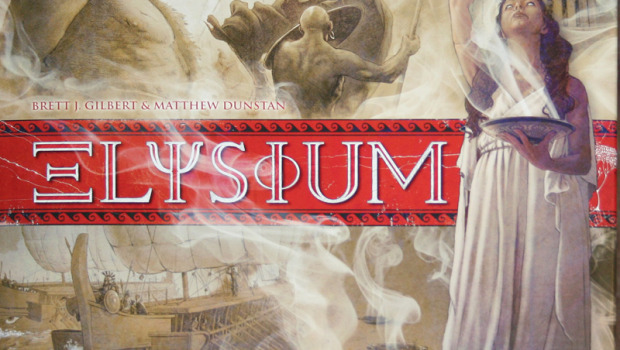 Elysium, simply put, is a colossus of a board game. 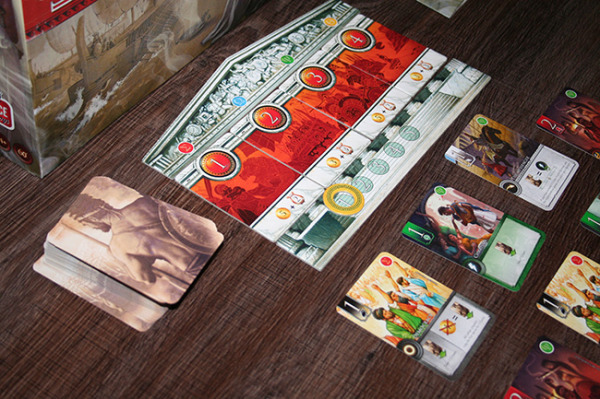 Designed by those responsible for the adored “Splendor” game from 2014; Elysium is another set collection type game in the world the pantheon of the Greek gods. Elysium sees you take the role of an ambitious demigod with eyes on a place at mount Olympus. It’s time to gather the Hoplites and form a phallanx because this … is …. ELYSIUM! Not quite the same, is it? 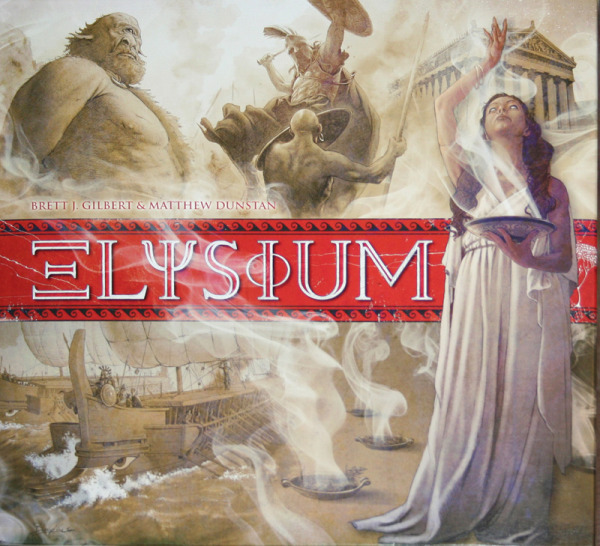 Elysium is a board game that is perhaps simple in concept but for many will provide a steep learning curve. In Elysium players compete for the favour of the gods by recruiting the aid of heroes and gods, whilst collecting powers and items – all for the sake of those ever important victory points. Over the course of 5 turns players will transfer cards acquired to “Elysium” and write their own tale of legend to get the biggest thumbs up from Zeus and co.
Start by randomly selecting one side of the “pediment” template to place at the centre of the table. Underneath lay out the 4 appropriate quest cards for your number of players, ascending from left to right in numerical order. Place the “steps” marker beneath the quest cards with the epoch token on the first space of the epoch marker. Place all Gold, Victory points and trigger rings in a shared reserve within reach of all players. Deal a player board to each player who then assembles the board in front of them. Give the #1 disc to a random player (works as a turn tracker) Proceeding clockwise give the other discs to the other players in ascending order. 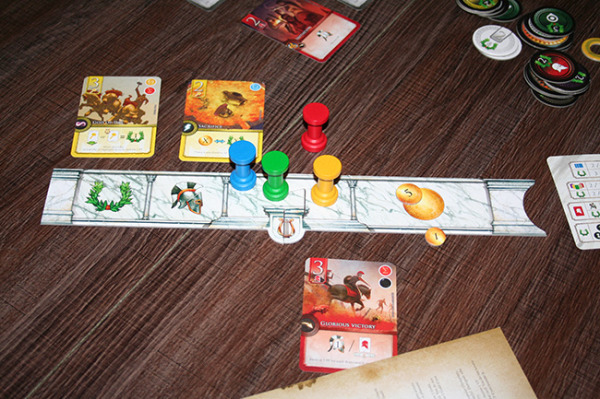 Each player takes 4 gold, one column of each colour and a number of Victory points equal to the number on their disc and places them all in the appropriate space on their player board. Place the remaining pile of face down family cards near the Agora, with space for a discard pile. Lay out the level 3 bonus tiles and the 10 family bonus tiles matching the 5 families to be used in this game. Note: there are some minor adjustments to setup that must be made in specific scenarios but these are clearly labelled in the manual. Elysium plays over 5 rounds (referred to as epochs) with each epoch divided in to 4 phases. This is the refresh stage, and thus is skipped entirely in the first epoch. The player with disc #1 goes first. Players will take 4 turns within this phase. 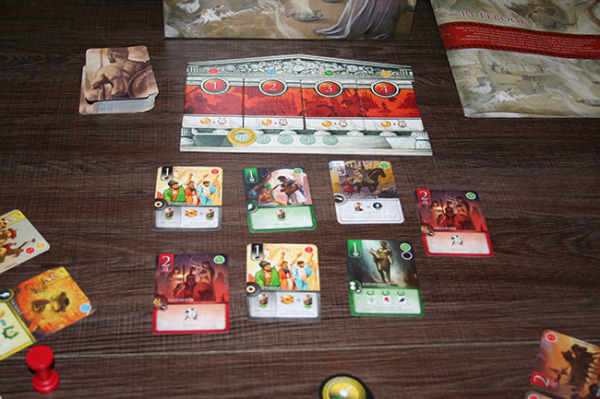 On each of their turns a player must either take 1 quest tile (altering the turn order for next round) to a maximum of one per round, or take 1 family card from the Agora, which transfers immediately to that players domain, the area above their player board. To be able to take a family card a player must have the required colour of column still available on their player board. Once a player takes a card from the Agora they must dismiss one (and only one) of their coloured columns from their play area for the rest of the round. The colour of the dismissed column does not have to match the colour of the family card just taken. After four turns are played each player should have taken 3 family cards and 1 quest tile. Note that some times you will not be able to take 3 family cards as you may no longer have the required colour amongst your columns. In this case that player takes one card from the top of the family pile. That card is transferred to that players domain FACE DOWN and becomes a citizen card. More on that later. Many cards have a power to be used within the action phase. If a card is in a player’s domain (and not a player’s Elysium…mostly) its actions can be triggered. There are five types of ability that are triggered at different times. These types are distinguished by a symbol at the left border of the card. Instantaneous powers are used at the exact moment that you take the card. Permanent is always active so long as the card is in your domain. Eleusis abilities activate only if you have another Eleusis card in your domain. If not then you can’t use this power. Once all players have completed all four turns in phase 2 then phase 3 begins. First players reallocate the disks or turn markers according to the quests taken by each player in phase 2. The player with quest #1 receives disk # 1 etc. Players then have the opportunity to transfer cards from their domain to their Elysium. The number you can transfer is dictated by the Lyre symbol on your previously completed quest. Players must also pay the cost in gold to transfer a card, according to that card’s level (either 1, 2 or 3); gold spent this way is returned to the common reserve. Rules of Legend state that each card transferred to Elysium must either begin a legend, or join an existing one. This is the set collection element to the game. Once a legend has acquired two cards, a citizen card may also be placed in that legend as a sort of wild card to fill a gap. The cost to do so is equal to the card the citizen would replace., meaning a citizen used in a legend to replace a level 2 card, would be cost 2. Be warned however, a citizen in a legend rewards -2 victory points at end game scoring. There are also rewards to be had for the first player to complete certain legends, but it is also possible to steal these bonuses at a later date. This is preparing for the next epoch phase. Place all columns back on their board. Straighten up any exhausted activate cards. Begin the next epoch with phase one, Awakening. Start by removing all cards in player domains from the game, the cards score NOTHING. The each legend is worth victory points as follows. Some cards also have Chronos powers. To use these powers the card must be in a legend. These powers can earn a player additional victory points during scoring. Players must subtract 2 victory points from their score for each citizen in one of their legends. The victory goes to the player with the highest VP total. To that player and that player alone, goes the right to high five Zeus and chill at mount Olympus with thematically appropriate snacks. Please note that the complexity of Elysium extends far beyond this guide, which is only intended to shed a little light for those considering such a purchase, but to do this game full justice I would have quadruple my current word count, and probably chisel the entire review onto stone tablets. There is so much variety to be had in mixing 5 combinations of the 8 available families and so much potential for sneaky comboing, but sadly there just isn’t the time for a detailed examination. The words “Race for the Galaxy” come to mind. For those not familiar with the basis of this frequently drawn comparison, Race for the Galaxy is another combo cracking card game similar in its level of complexity. There is however one significant different from my standpoint. Elysium encourages you to rack up some lovely combos in your domain but in time you are forced to snap them in half, to get your cards to Elysium, thus scoring them. This can be a very difficult decision to make, and adds a whole extra shade of strategy to your play style. Thus it is a fair comparison on the surface. Elysium is far from a race for the galaxy clone, yet fans of the later are still likely to fall for its Greek charms. One minor gripe I feel obligated to mention is the theme. The artwork is nice and all but it feels rather throw away. If you are looking to be reborn as Hercules the II, this may be the wrong game. The game mechanics, whilst solid, are in no way inseparable from the games setting. You could just as easily be a lich king building a necrotic army, or constructing a sci/fi trade empire to span the galaxy. Hardly worth a thumbs down but certainly a mention. Over all I found Elysium to be quite the charmer, once I had successfully smashed my face through its daunting learning curve. It is certainly not a gateway game for any one looking to get in to the hobby, but I heartily recommend returning for a second look once you’ve passed go a few times, and racked up a little experience with the board gaming past time. Stick with it, and you’ll find the game a rewarding experience, but with its intricate strategic potential and the required man hours to even begin to glimpse its true beauty, many a casual player may find Elysium £50 of “I have no idea what I’m doing”. Justified Croak loves nothing more than books, miniatures, board games, RPG supplements and clever Ikea storage that helps me cope with all of the above.